Red Bull Music Festival is known for curating tasteful, heavy-hitting lineups of shows spread across a month that appeal to wide ranges of taste. The 2019 NYC edition has finally been announced and the lineup does not disappoint. FKA twigs, Rosalía, Tierra Whack, Teyana Taylor, JPEGMAFIA, and Holly Herndon serve as some of the highlights. FKA twigs will be making her return to performing with a show at Park Avenue Armory, where she last performed in 2014, Rosalía will be performing at the opening night of the new Webster Hall, Teyana Taylor will present an audio-visual experience bolstered by her all-female production company, Tierra Whack will be rapping material new and old and Holly Herndon will be showcasing her highly conceptual new album, PROTO. 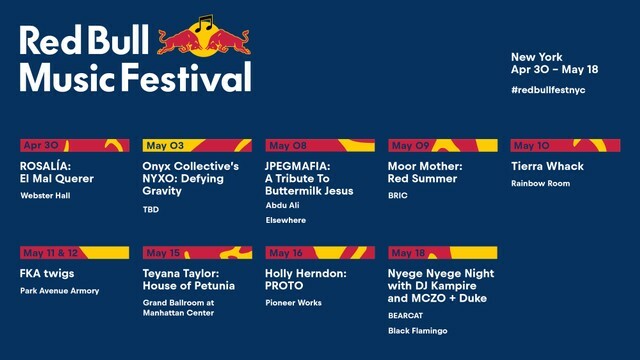 Red Bull Music Festival NYC will run from April 30 to May 18. Tickets are on sale today at 10AM ET. For tickets and full lineup info, visit redbull.com/nyc.